Marriage is God's creation. When God united the first man and woman, Adam and Eve, He established the relationship of husband and wife. God's intent was that marriage would be for life. He expected that spouses would seek to love, support and share life with each other. God created marriage to be a blessing. As an engaged couple planning to be married soon, you can do no better than to commit yourselves to the establishment of a God-pleasing marriage. You will want to begin with a fitting Christian wedding. The material offered in the following few pages is provided as a guideline for what we believe to be good Christian practice. We want to assist you in designing a memorable Christian service that will glorify God and begin your lifelong marriage relationship on a joyous and positive note. 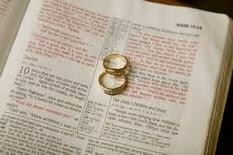 The counsel we offer, the suggestions we make, the church policies we uphold, are all done in love for you as a couple. We want to be as helpful as we can possibly be as you plan your wedding. May the Lord bless you as you plan for your future together as husband and wife!